BMW’s “Window Into the Near Future” project, run in New York in 2012, has been recognised with Gold in the Out of Home category at the 2013 Andy Awards. The BMW i Window Into The Near Future digitally transformed passing cars into the all-electric BMW i3 and plug-in hybrid BMW i8 Concept vehicles. The window also calculated how much money would be saved and how many tons of CO2 emissions we can reduce annually if each transformed car were all-electric. “The upcoming BMW i vehicles are very futuristic looking. But amazingly, they’ll be seen on the road as soon as late 2013. 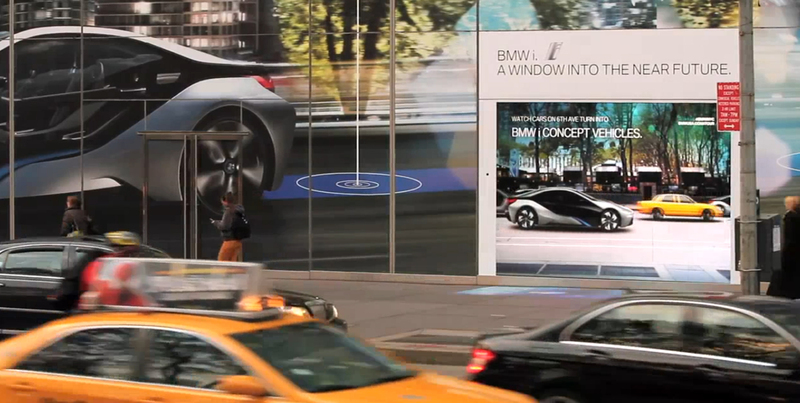 With the BMW i Born Electric Tour making its stop in New York City, we wanted to create an innovative way to create awareness of BMW i, drive people inside the event and reinforce the message that the future is closer than you think. 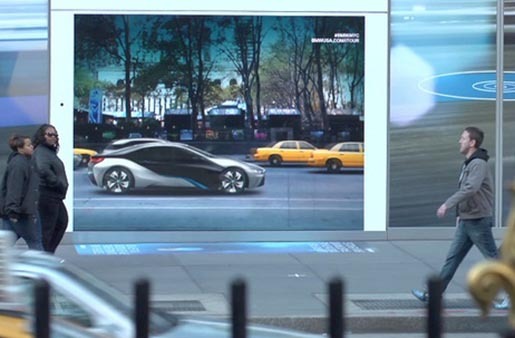 We turned a street-level window at the event location into a digital reflection of passing traffic, transforming the passing cars into BMW i3s and i8s to give passersby a glimpse into the near future. Real BMW i vehicles could be seen inside”. “We began with the idea of turning live traffic into BMW i vehicles in a window’s reflection. The challenge revolved around creating that illusion. Using a learned background ensured the reflection of Bryant Park across the street matched the number of leaves left on the trees, the holiday vendors, etc. Then, using blob detection technology, we transformed vehicles and matched their speed/behavior with BMW i vehicles. Adding to the realism, we also detected yellow vehicles and projected them as passing taxis. This enhanced the one-to-one relationship of live traffic and projected vehicles. The Window into the Near Future campaign was developed at KBSP (Kirshenbaum Bond Senecal + Partners) New York by chief creative officers Ed Brojerdi and Izzy DeBellis, executive creative directors DJ Pierce and Michael Craven, group creative director Marc Hartzman, associate creative director/copywriter Kevin Keehn, associate creative director/art director Cesar Rubin, art director Olena Shmahalo, senior technical producer Dennis Hanley, lead developer Jake Lee-High, product analyst Matt Richard, product architect Chris Gsell, director of interaction design Jed McClure, interaction dsigner Diego Rioja, director of production architecture Vikram Tank, chief information officer Matt Powell, executive technology director Mike Dory, executive technical producer Nick Meyer, producer Jona Goodman, head of content production Mara Milicevic, group account director Katie Klumper, account director David Solomito, account supervisor Gabriela Benitez, print producer Virginia Kornfeld, executive print producer Deirdre McMurray, retoucher John McClafferty, project manager Ed Miranda, working with BMW EV/BMW i Brand Marketing Communications Manager Joan Bowen. Filming was shot by director Marc Hartzman with The Armoury producer Joe Dimaio and editor Kevin Osgood. Projection was produced at Fresh Air Flicks was by A/V specialist Glen Sanders and IT producer Mike Kelberman.